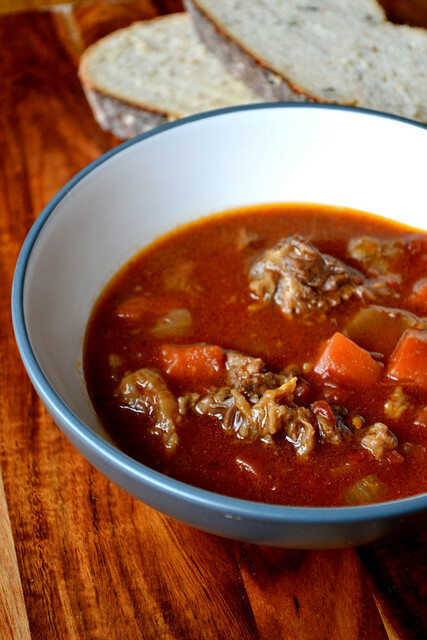 Renowned, in Britain at least, for its comforting, restorative properties, Oxtail Soup – or, in this case, Oxtail Stew – is consumed as eagerly as possible by the sick, aged and infirm. As a man who fits all too perfectly into two of the three categories, it seemed only right to bring you a recipe for my own personal remedy. Oxtail stew is all about good, honest food. A hearty portion of a hearty meal, without too many complex flavours. Served alongside a couple of slices of a flavoursome sourdough, there probably isn’t anything as satisfying. Having said that, oxtail stew is made markedly better by the presence of a subtle hint of spice in the form of cloves and star anise. These aren’t flavours that will dominate the dish, but they do pair nicely with the dark, rich oxtail meat. 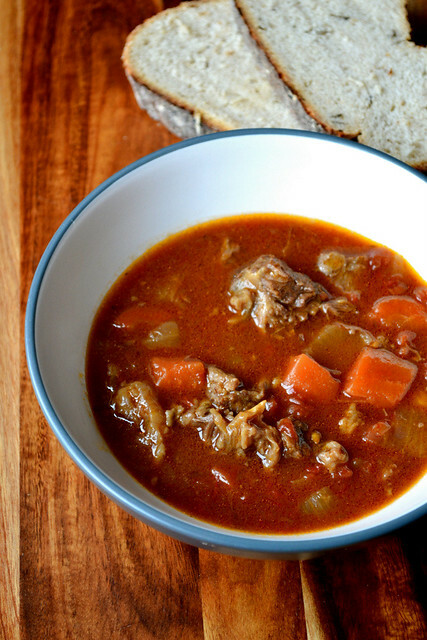 Supplementing the richness of this stew is a small glass of stout or porter. The stronger in flavour, the better. I used a double stout, with flavour notes almost reminiscent of treacle. And if you don’t want to waste the remnants of the bottle, you can finish it off by making porter cake. Though drinking it could scarcely be described as waste. What you serve alongside your oxtail stew is up to you, but I always feel that two types of carbs are called for; potatoes (smashed, not mashed) and bread (for mopping). A small chunk of mature cheddar – complete with naturally formed salt crystals – never lands too far from the mark either. I know that oxtail doesn’t appeal to everyone – my own mother wrinkles her nose at the very prospect – but it is a fantastic cut of meat. Still, if you’re not willing to give it a shot, my recipes for Beef Shin Ragu, Ox Cheek Goulash, or even Slow Cooked Beef Curry might hit the spot. Heat your oven to 200C/180C(fan). Coat the oxtails in half the olive oil, salt and pepper. Roast in the oven for 10 minutes, until browned. Meanwhile, soften the onions and carrots in a large saucepan using the remaining olive oil. Once the meat is browned add it to the vegetables. Coat the content of the pan in the plain flour. Add the remaining ingredients to the pan, making sure everything is fully incorporated. Slide a lid onto the pan and allow to simmer gently for 2 hours. At this point it should be easy to remove the meat from its bones. 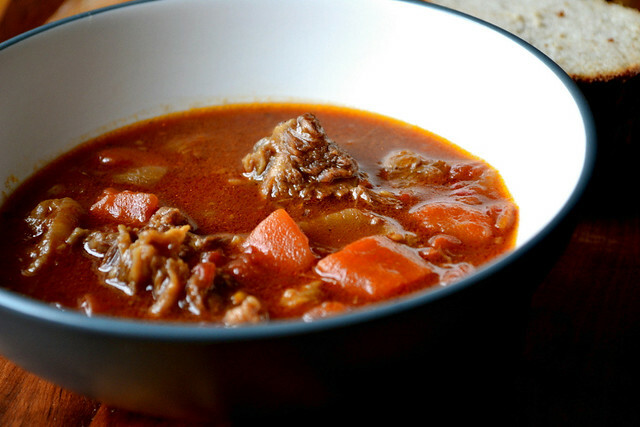 Once the meat has been separated, return it to the stew and cook for a further 30 minutes to an hour. Serve immediately, or set aside to cool for the next day. Cost: Being relatively inexpensive – in the world of meat – oxtail is an ideal cut of meat to use when being frugal. And because oxtail stew is a particularly simple, no frills dish you should have no problem in recreating the entire confection for as little as £7. I can almost smell it; looks and sounds delicious. I will definitely give this a try. Thank you! Please do – it was such a nice meal. 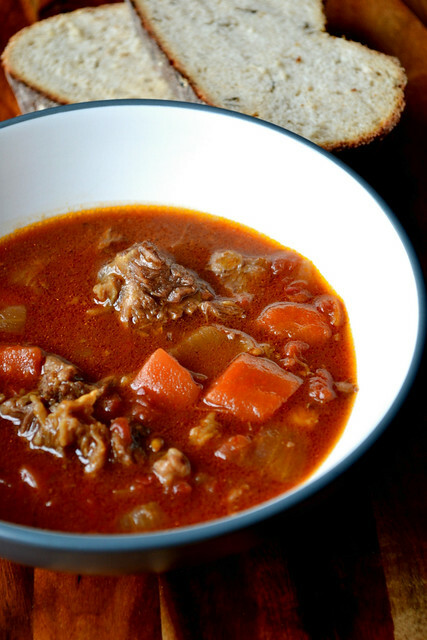 You’ve made me hungry for oxtail stew… One of my favorites from childhood. Going to freezer and if I have oxtails, we will oxtail stew for dinner. Thank you. That was the idea 🙂 – I hope you found some. I’m always buying Oxtail whenever I see it. I cook the meat first the day before slowly. Next day take all the meat of the bones and add everything else can cook slowly, one wonderful meal! I only had a half sandwich for lunch. I need this now…..
You need to eat more than that in preparation for your cycling! Too true. I’m wasting away. Get munching! I’m on to my second breakfast. I’ve only made it once but I love oxtail stew. It’s a gorgeous meal – I’m not sure I’d make it all the time, but definitely now and again. Thank you – I don’t eat enough of it! Oxtail is a fantastic cut of meat. Beautiful stew. Thank you, Michelle – It has such good flavour. This looks so delicious and yummy, thanks for the recipe! Yum yum. Just cooked about 2kg of oxtail a few weeks ago using the Chinese method of soy sauce, rice wine, rock sugar, ginger, star anise seeds and Sichuan peppers, and since I like to experiment I added one large tinned tomatoes and reduced the water accordingly. It took a few hours on low heat in a heavy casserole dish, and the meat was literally falling off the bones when done. It. Was. Like. Eating. Pure. Happiness.